Gateway to 32kms of sun, sand and surf. Anna Bay was originally called Hannah Bay, which in accordance to legend was named after the vessel Hannah, alleged to have wrecked at One Mile Beach in the early days of Port Stephens. Fact? Well a schooner named Hanna is recorded in wrecks on the NSW North Coast, to have wrecked in 1851, but was never identified. The vessel may have been a small trader, well known locally. The name was changed on 15th of May 1896 by the postal authorities, as most locals already called it Anna bay, and the teacher of local school (John Emery), wanted to call the school by the name of Anna Bay School. The village of Anna Bay is the gateway to the Stockton Beach Sand Dunes and Birubi Point. Anna Bay has a village shopping centre where you can stock up on the basics for your stay. As well as accommodation, the village’s facilities include a supermarket, ATM, fuel, bottled gas, chemist, coach stop, EFTPOS, pub, mechanical services, medical facilities, newsagent, public telephone, restaurant, takeaway food, and places of worship. The famous local dolphin population are in the area year-round, and the fish are always biting regardless of the season at Anna Bay. Birubi Point is the northernmost point of the 32 kilometres of Stockton Beach, a popular spot for surfers, and departure point for 4WD Adventure Tours of the extensive sand dune system, the largest moving coastal sand mass in the southern hemisphere. Enjoy the patrolled surfing beach at Birubi Beach. Great rock and beach fishing at Birubi Point. Enjoy whale watching in season. 4WD the Stockton Sand Dunes. Take a cruise and watch dolphins and whales. Hire a jet ski or learn to scuba dive. Visit the galleries and weekly craft markets. Go on a horse or camel ride. Enjoy sand boarding or quad biking. One-Mile Beach in Anna Bay is a hidden oasis which can be found via a series of sandy paths that lead to the secluded beach. 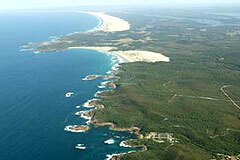 Most of One-Mile Beach is surrounded by bushland that belongs to the Tomaree National Park. The David Graham Golf Course is a 9 hole par 3 golf course fully lit for night golf. There are 27 elevated tees, 260m long range, 3 large target greens – 80m, 120m & 160m. This is a first class practice range and private lessons or clinics available. There is discount golf pro shop and a 20 hole mini golf which offers discounts for families & groups. Anna Bay is a place where the unlikely worlds of the Australian bushland, beach culture and small-town life naturally come together.